May 19, 2016 – Osborne, Kansas – Osborne Industries, Inc., a leader in the development of RFID (radio frequency identification)-driven swine feeding and management systems will introduce its latest model of the FIRE® (Feed Intake Recording Equipment) pig performance testing feeder at the World Pork Expo, in Des Moines, Iowa, June 8-10, 2016. Osborne can be found at booth 451 in the Varied Industries Building. The Osborne FIRE System is the worldwide gold standard in pig performance testing technology. Used by more universities and genetics companies than any other system, FIRE reliably records actual individual feed consumption and body weights of growing pigs in groups, simulating actual commercial production. Time and duration of each meal, total meal events, body-weight change and feed conversion can all be monitored with FIRE. The new Mark IV FIRE Feeder features all the same benefits of previous FIRE models, with improvements to minimize maintenance and improve performance accuracy. The feeding station features an all new feed saver front panel, made of impact- and corrosion-resistant pDCPD composite plastic, which helps prevent feed from spilling and collecting under the trough as animals are eating. The extended flange of the front panel also blocks other debris from collecting under the trough, saving users significant labor time. Multiple improvements have been made to the new models of the ACCU-ARM® weigh race and include anchor brackets that allow users to tip the weighing platform in any direction for ease of cleaning. Additional design improvements minimize the event of multiple animals simultaneously eating from the feeder or standing on the weigh platform. WinFIRE™ , the software application for FIRE, now allows for real-time data transfer, improving the monitoring of individual feeders in large systems. WinFIRE generates a number of useful reports to individually identify superior-performing animals. 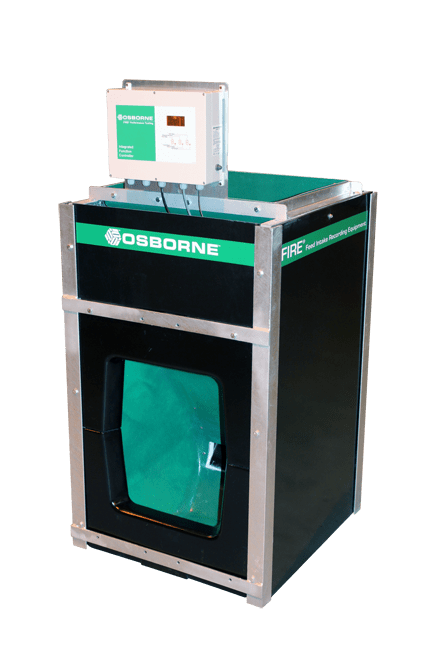 To see Osborne’s Mark IV FIRE (Feed Intake Recording Equipment) pig performance testing system, visit their booth at space 451 in the Varied Industries Building at the World Pork Expo. Osborne’s complete line of swine management equipment will be on display. For more information, contact Osborne at 1-800-255-0316 (1-785-346-2192), e-mail info@osborne-ind.com or visit osbornelivestockequipment.com.